Leona's at 1938 W. Augusta Blvd. 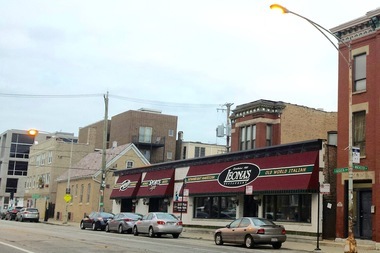 EAST VILLAGE — A building owner wants to demolish the Augusta Boulevard structure that's been home to a Leona's Italian eatery since 1985, but his request has riled up local preservationists, and a new alderman is determined to keep the the century-old structure "as is." The Commission on Chicago Landmarks approved demolition of the building Thursday, but the battle now moves to the City Council, where Ald. Brian Hopkins (2nd) intends to preserve it. “There’s no question about it, the community would like to save this building," Hopkins said after Thursday's hearing. He said, "Now that it’s under council purview, I will take some steps and have a discussion with the owner. We need some time to work through this." Ald. Brian Hopkins testifies before the Commission on Chicago Landmarks Thursday. 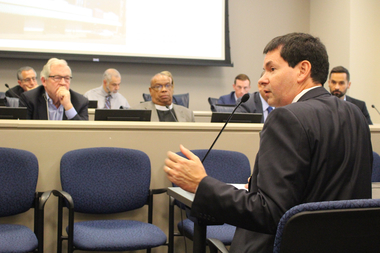 At a Landmarks Commission hearing on Thursday, commissioners endorsed the findings of the Department of Planning and Development that the building does not contribute to the historical and architectural significance of the East Village District and approved its demolition. Just two commissioners, Ernest Wong and Juan Gabriel Moreno, opposed the measure. Yet commissioners also emphasized that Hopkins would have an opportunity to deny or defer the demolition as the process moves to the City Council for final approval. Leon Toia, CEO of Leona's Pizzeria, sold many locations last year. The East Village Leona's opened in 1985 and the building was sold for $1.84 million to Sedgwick Acquisitions, a venture backed by MCZ Development in February, state records show. Located at 1936-44 W. Augusta Blvd., the properties are a collection of buildings including a Victorian two-flat (which dates back about 120 years, according to the Cook County Assessor's Office), which later grew into a local dairy that surrounded the original structure in the early part of the 20th century. The timing, however, turns out to be key. Was it largely constructed after 1920, when the now-landmarked East Village District was coming into its own, or did it predate that, which would undercut its argument for preservation? Hopkins is asking for anyone with historical records or photos to come forth to try to clear things up. "Any photographic evidence from the ‘20s would be extraordinarily beneficial," he said. On Wednesday, the day before the hearing, a Leona's manager, Steve Mantooth, said he was unaware of Mullen's plan to demolish the building. "We are all concerned for our jobs," Mantooth said. According to the Department of Planning and Development, it became a milk depot in the '20s and then the city’s only Ukrainian dairy in the ‘40s. Commissioner James Houlihan said they had to balance preservation with development and that it would be a “mistake” to delay the demolition. Yet Adam Natenshon, vice president of the board at Preservation Chicago, proved to be the most eloquent defender of the building. Natenshon drew parallels with Parson’s Chicken & Fish on Armitage as a successful restaurant that had renovated a building in danger of demolition. Tod Mullen, a project manager for MCZ Development, however, testified that the building "doesn't have a whole lot of commercial value to us," considering the uses it is zoned for and the fact that it's mostly one-story high. Houlihan emphasized to the developer that their new project would be subject to review. “A 44-story high-rise might not be consistent with the district,” he said. “We fully acknowledge … our proposed building plans would be subject to review,” said Mullen's attorney Nick Ftikas. “We would not be planning a tall building,” but a 12-unit residential building.